My one and only other previous experience of live improv was in the hands of the venerable Mischief Theatre team and a performance of Lights! Camera! Improvise! in London in 2015. It was a heck of an evening to see them weave a movie from a mixture of inputs from the audience, and was quite a team for The Same Faces to follow. 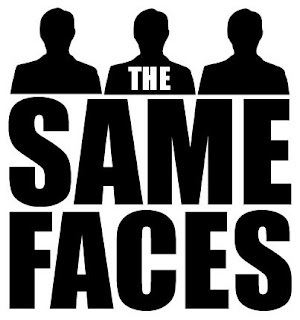 Founded by Tom Young, The Same Faces have been performing in Leicester and Northampton for a number of years and have swelled their ranks of performers to allow a huge amount of variety to not only the show but those bringing it to the stage. For my first encounter with the group, the performers I was to see were Tom Young himself who was joined by Dave Gotheridge, Jen Kenny, Thomas Lawrence and Becky Moore and musician David Burton. The format is simple, through a series of games the audience provide key ingredients to allow the performers to bring the stage alive with their impulsive talent. These can vary from the very simple addition of numbers or colours, to specialist subjects, careers or locations. It is an expected hit and miss, however the talent on stage keeps the evening firmly in the hit department far more often than the other. Often it crashes into the quite superb realms of shear brilliance as that moment of inspiration clicks and we sit in amazement at how an ice cream palour has become an almost perfect venue for a film noir and the stirring adventure, The Maltease Whippy. Also at the top of the bill is Greatest Hits, which provides like the Mischief show, a scary skill of these improv teams, the way they can form songs before our eyes. Tom Young's reggae takedown of the Daily Express was a particular highlight of the evening, and Jen Kenny manages to provide a scarily catchy number entitled "Look Away Now". Music rears its head later as well in the show to more success in the problem solving bartender scene. By the way of song, the performers tell their problems (provided by the audience) and also in song, the bartender (Jen Kenny) solves them. It works, somehow, more often than not and by the end, performers and audience alike and happily singing along to "Forget The Bruce". Very occasionally scenes don't work as is the danger of nights like this, and for me a casualty on the night was the Question This round, which didn't gel, but such is improv, next month it could be the best round as the worlds of inspiration collide. One moment that everything perfect did happen was during the Party Quirks round and the handing of the quirk of "only being able to talk in pick up lines" to Thomas Lawrence. It was such a perfect moment, that party host Tom Young abandoned guessing the quirk (the object of the game) for a while to see how long he could go on. It turned out quite a while and provided one of many highlights in the evening. It is safe to say that it took me a while to finally get to see The Same Faces and after seeing them, this is an obvious mistake on my part. They are a bunch of highly talented performers, who clearly work well together and provide not only an entertaining and funny evening, but also a really friendly environment to boot as well. There are very few ways that you could get as much entertainment for two hours for a fiver than this.